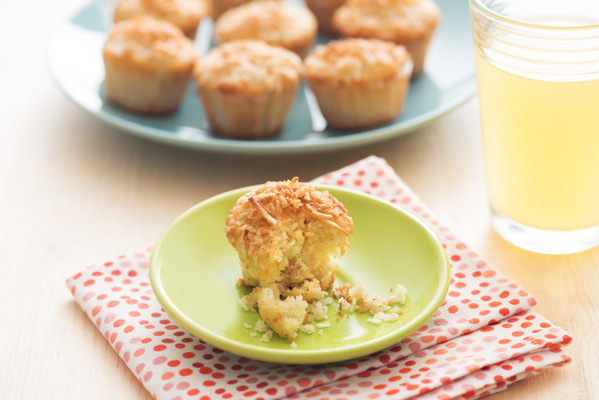 Using juice in these muffins adds flavor and keeps them moist. For a dairy-free option, use vegetable oil instead of melted butter. Preheat oven to 375°F. Line 24 mini muffin cups with paper liners. In a large bowl, whisk flour with oats, granulated sugar, baking powder, nutmeg and salt until well combined; set aside. In another bowl, whisk juice, egg, lime zest and vanilla until blended. Stir in melted butter. Stir wet ingredients into dry ingredients until just moistened. Fold in 1/3 cup desiccated coconut. Scoop into muffin cups. Toss remaining coconut with brown sugar until combined. Sprinkle evenly over top of each muffin. Bake for 13 to 15 minutes or until a toothpick inserted into the center comes out clean. Cool in pan on rack for 5 minutes.